There aren't too many pictures of Carolyn wearing her engagement ring and the ones that I do have are quite blurry. 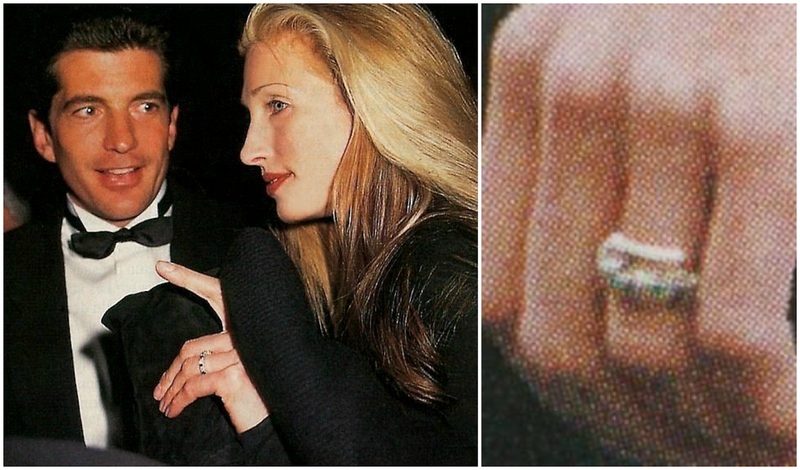 However, I'll post these two pictures for the sake of seeing the ring John Jr bequeathed to his future wife. It is a platinum band surrounded by diamonds and sapphires. The sapphires are quite surprising as I would have pictured CBK as a simple diamond type of girl. Coloured gemstones are not quite my taste but the ring is a beautiful piece of jewellery. I'm not too educated on this topic but perhaps the ring was passed on from Jackie to JFK ... does anyone know? 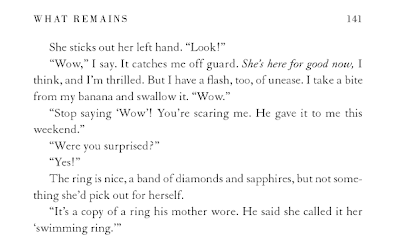 Unfortunately the ring wasn't to C's particular liking, according to Carole Radziwill, in her book "What Remains". I could see Carolyn as just a simple gold band kind of girl but this piece of jewelry was exquisite nonetheless. 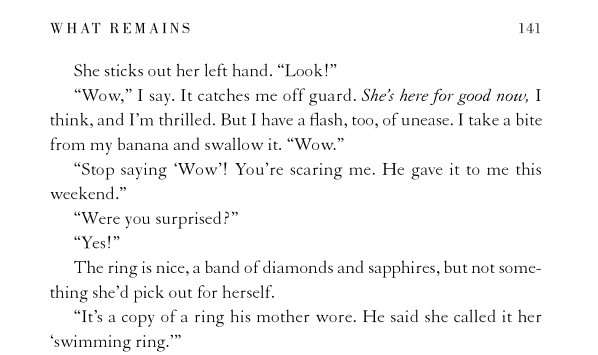 An excerpt from Carole Radziwell's book "What Remains"
*Update* Carolyn's ring was modeled after one owned by Jackie Kennedy. It was one of Jackie's favourite pieces - her "swimming ring" - given to her by her long-time companion, diamond dealer Maurice Tempelsman. 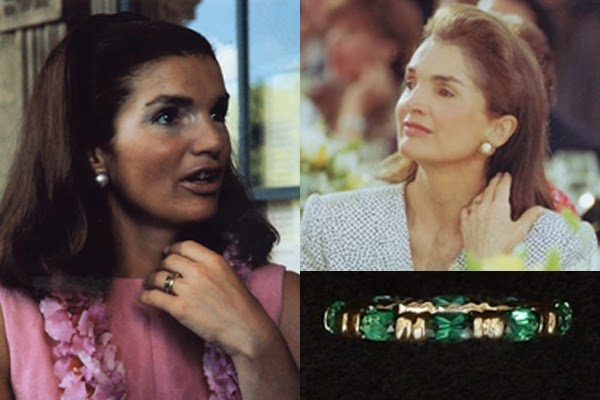 Jackie Kennedy's emerald and gold "swimming ring"
*Update 2* I've gotten a chance to read RoseMarie Terenzio's book 'Fairy Tale Interrupted' and there was an interesting back story on Carolyn's ring. Apparently, Tempelsman had a hand in creating CBK's ring as well. RoseMarie, John's assistant, picked up a package from Maurice Tempelsman's office (not knowing the package was the ring!) and John kept it in a Duane Reade plastic bag in his office desk. 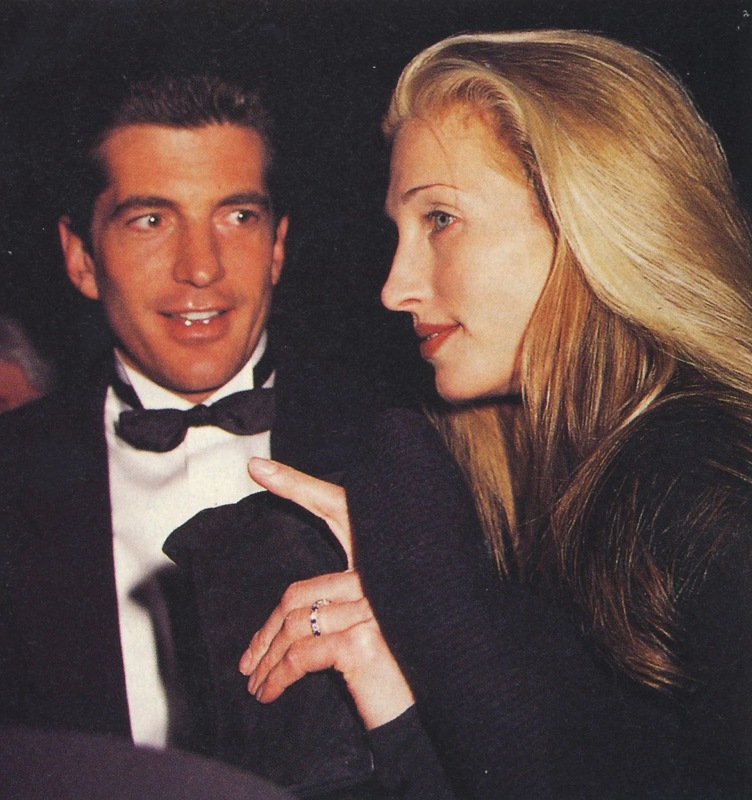 He eventually proposed to Carolyn on July 4 weekend (1995), while the two were fishing at his house in Martha's Vineyard. His choice words? "Fishing is so much better with a partner". The ring Tempelsman designed was a replica of an emerald and sapphire Schlumberger ring that Jackie had owned. If you have around 10k to spare then you can pick yourself up a similar version at Tiffany's! The sapphire and diamond version is below - I love that John changed the gemstones to fit his future wife but still kept his mother's influence. Thanks to Jessika for the update and the Ultimate Jackie blog for info as well!